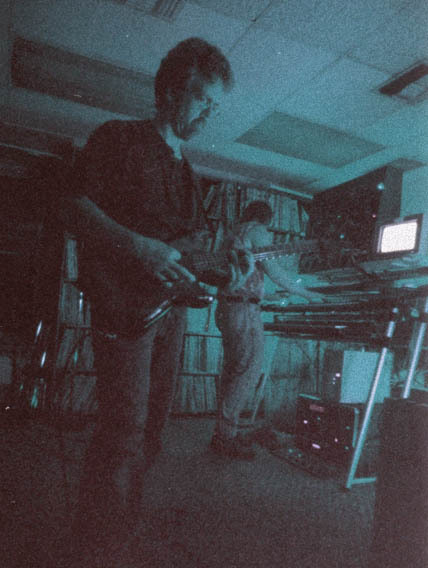 Orbital Decay consists of electric guitarist Scott Watkins Tim Richardson and synthesist Terry Furber of Quakertown, Pennsylvania, located north of Philadelphia and south of Allentown/Bethlehem. Originally founded in 1979, the year when Skylab's orbit decayed and returning it to Earth in a firey display, Terry and Scott formed a band influenced by the likes of Tangerine Dream, Klaus Shulze, and Pink Floyd. Today, Terry and Scott make improvisational electronic space music with the energy of fusion styles from the 1970s. This means that Orbital Decay charts unexplored territory of sound and mood. 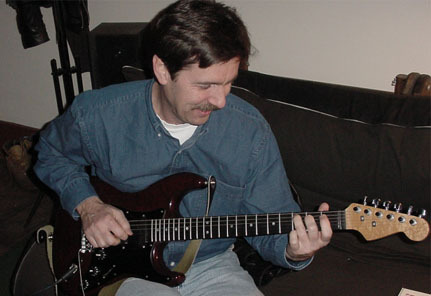 For a short time, Tim Richardson replaced Scott, including the performance at WDIY. Terry Furber has the keyboard chops of a progressive rock keyboardist, enabling him to play soaring synth solos over a classic Berlin School sequence. Yet he can display the restraint required for a deep space excursion in the darker, more introspective moments of his music. 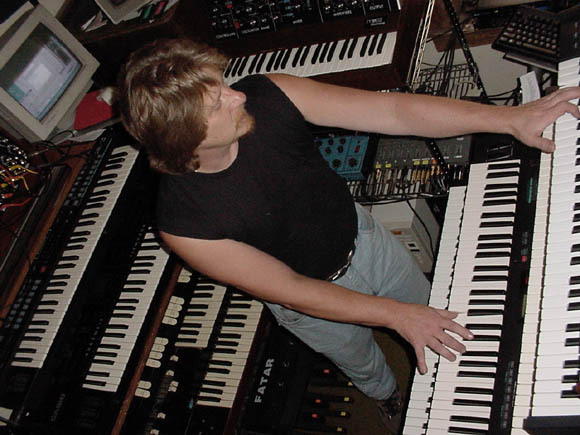 In addition to being a player, Terry also builds and programs his own synthesizers and computers, sometimes using older technology obtained at bargain basement prices. He then proceeds to squeeze every ounce of music possible from his concoctions. An example of his ability in this area is his minimoog/MOTM synth which was Keyboard of the Month in Keyboard magazine. Scott Watkins (pictured above on Star's End) was another founding member of Orbital Decay. Due to other life commitments, Scott temporarily left the band, making way for the return of Tim Richardson. The picture at the right is of Tim at Orbital Decay's studio in Quakertown. Back in the '70s, Tim played with the original members of Orbital Decay when the musical direction was a space/fusion format. After 20 years, Tim received a call from Terry after Scott left the band. Tim's guitar influences include John McLaughlin, Jimi Hendrix, Jeff Beck, Robert Fripp, Al DiMieola and John Scofield. His musical interests are quite varied and include jazz, fusion, progressive rock, and electronic music. Orbital Decay has three self-released CDR albums featuring their prolific studio jam sessions. These CDRs were featured on the show in December, 2001, as part of the Special Focus on Orbital Decay.